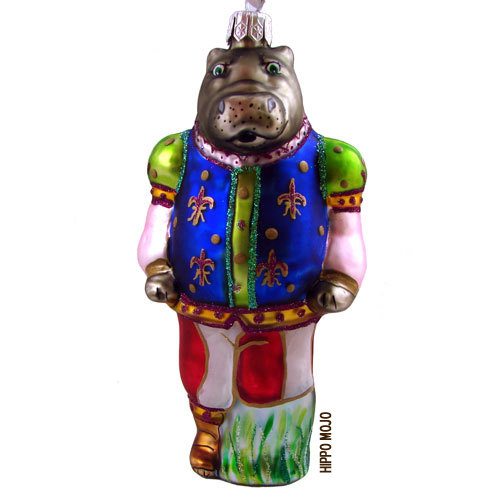 Horace the Hippo will be a fanciful addition to your holiday tree or hippopotamus ornament collection. He is from American designer Abigail Pfeffer from her exclusive collection at Tannenbaum Treasures. Horace is a handcrafted glass ornament, mouth blown and hand painted by European craftsmen. Horace measures about 5″ high and comes individually boxed, ready for gift giving. Horace is not the cheapest ornament around, but he’ll bring many years of happiness to your hippo friend or fanatic. Since their founding in 1983, Tannenbaum Treasures has been exclusively in the business of importing the finest holiday decorations from Europe. Their products are hand-made in Germany and Poland. Tannenbaum Treasures has developed an extraordinary collection of exclusive new designs. Created by American artists, these designs are sold under the name Abigail’s Collection®. These designs are influenced by the finest in European tradition but are also distinctly American in their appeal. They represent a young, fresh approach to the noble tradition of hand painted glass ornaments. Crafted by the best Polish artisans, Abigail’s Collection® ornaments have met with critical approval and are fast becoming among the most popular ornaments among serious collectors. Buy your own Horace the Hippo ornament here.